Toenail Fungus Treatment - Westland, MI 48185 Foot Doctor - Dr. Kane & Associates, P.C. Toenail fungus is a frustrating and embarrassing condition that is common for many people. It typically starts as a tiny white or yellow growth below the tip of the toenail and spreads deeper as the infection worsens, causing the nail to discolor, thicken, or even deteriorate at the edge. Fungal nails can be identified by thickened or ragged nails that are distorted in shape. They are lacking a shine and tend to be darker in color due to a buildup of debris beneath the nail. Patients are more at risk for developing nail fungus if they wear socks and shoes that do not allow for proper ventilation. Damp communal spaces like gyms, swimming pools, and public showers can also serve as a source of fungus. Those who work in humid environments are also at greater risk. More severe cases of toenail fungus can be very painful and cause serious damage, so it is important to visit your podiatrist if you suspect you have the condition. 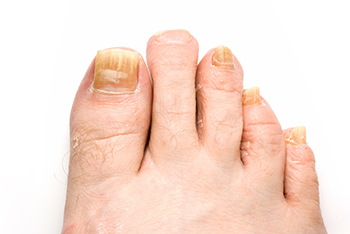 At its worst, fungal nails can lead to other infections that can spread beyond the feet. Your podiatrist will most likely examine your nails for fungus. If there is debris under your nail, some of it may be scraped and sent to a lab to identify the fungus causing the problem. In most cases, toenail fungus can be treated at home. Over-the-counter antifungal creams and ointments can be applied to affected areas. Reduce pressure and pain on the nails by cutting the nails to a shorter length. If home care does not prove effective, your doctor may prescribe you medications such as oral antifungal drugs, medicated nail polish, or medicated nail cream. The use of laser therapy is also an option to treat fungal nails.